Spa Girl Cocktails was excited to participate in Doris Bergman’s annual Oscars lounge for the 2019 awards season! We had such a fabulous time at her event and love supporting a great cause. Spa Girl Cocktails has a cameo on The Haunting of Hill House on Netflix! Be sure to keep your eyes peeled during episode 1 for a special appearance from our vodka at the bar! The Tasting Panel Magazine recently featured our spa and pear vodka in their latest issue along with their tasting notes and pairing recommendations. You can read the full article here to see what Tasting Panel had to say, and get one of our signature cocktail recipes! 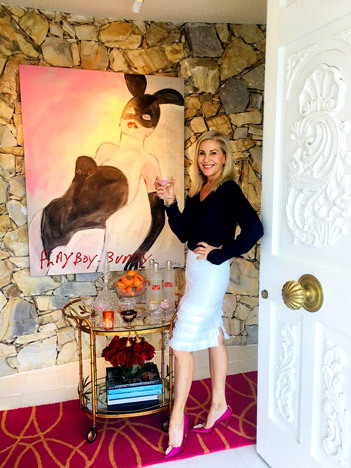 Elisabeth Collazos, contributor for LA-Story.com recently interviewed our founder Karen Haines about how she built a successful brand, what makes Spa Girl Cocktails so unique, and how to be a fabulous hostess! You can read the full article here and get a few cocktail recipes as well. Thanks again to LA Story and Elisabeth for the wonderful article. Spa Girl Cocktails was proud to be a part of Doris Bergman's 10th Annual Oscar Lounge celebrating all of the talented nominees! This is an event that is near and dear to our heart, and we look forward to it every year. Spa Girl Cocktails was featured in the recent issue of Amare Magazine! You can check out the full article here. We were so honored to be mentioned in the fall issue of West Hollywood Lifestyle Magazine! You can find our founder Karen and our signature martinis in the magazine by clicking here. Doris Bergman hosted her 8th annual style lounge and party in celebration of Emmy season. This event is a must for all Emmy nominees, past Emmy and Oscar Winners, Emmy presenters and other iconic figures in Hollywood. Spa Girl Cocktails was excited to be on hand pouring our Spa and Pear Martinis for this year's event which was held at Fig & Olive in West Hollywood. Proceeds from the event helped to benefit Wednesday's Child. Read more about this wonderful event below. The inaugural Global Spirit Awards took place at the Tropicana Hotel in Las Vegas, and Spa Girl Cocktails was awarded a bronze medal. Over 275 spirits were judged at this year’s award ceremony and 9 elite judges, with over 175 years of combined experience voted on the winners. You can get the full list of all of the award winners on the Global Spirit Awards and Food & Beverage Magazine websites. We are truly honored to be among the distinguished winners and are looking forward to this elite event next year! Hosts Amy Paffrath and Justin Walter recently featured Spa Girl Cocktails in their What's Good? segment for Focus TV. Susan Anton of the Las Vegas Review-Journal is not only a fabulous Las Vegas performer, but she's also part of the Spa Girl Cocktails family as our celebrity spokesperson! She recently shared her experiences as our celebrity spokesperson and why she loves our cocktails so much. Read her article here. Q'Rated Events hosted the first annual Season of Self Love Event at CURE Spa in Malibu. The event partnered brands and influencers in an epic Sunday afternoon party setting! Spa Girl Cocktails was on hand to pour our signature Spa Martini cocktails all afternoon and we loved spending an afternoon with other social media influencers and brands! Read more about a Season of Self Love here. Spa Girl at the 10th Annual George Lopez Charity Golf Classic! Spa Girl Cocktails was proud to be a part of the 10th Annual George Lopez Charity Golf Classic. Every year the tournament raises money for the George Lopez Foundation, and Spa Girl Cocktails was honored to help support this cause as part of the celebrity gratitude gift lounge! Joshua Tree's Pink Satellite Studio co-founders Chris and Karen Haines are featured in a great article by Palm Springs Life. Read more about this incredible partnership and epic destination. Spa Girl Founder Karen Haines was ecstatic to celebrate the Oscars this year in all its glory at Doris Bergman’s Style Lounge and Gifting Party. The event was held and Fig and Olive in West Hollywood. New York, NY – The Fifty Best, rating the finest in wines and spirits, has once again shined its spotlight on Flavored Vodkas. The Fifty Best recently hosted a flavored vodka tasting, where 28 contenders were evaluated for the distinguished "Best Flavored Vodka" awards for 2016.